The first artist, for Deleuze, is the architect, the one who distinguishes inside from outside, who draws a boundary, as we have discussed previously. This boundary is not self-protective but erotico-proprietorial: it defines a stage of performance, an arena of enchantment, a mise-en-scene for seduction that brings together heterogeneous and otherwise unrelated elements: melody and rhythms, a series of gestures, bows, and dips, a tree or a perch, a nest, a clearing, an audience of rivals, an audience of desired ones. While Grosz is talking about birds and how they delimit a territory here, I can’t help but think about the comic book creator as the most direct form of the architect (at least visually). Unlike a director of photography for a film, who chooses what is in a shot but is ultimately bound by what exists (though the film assemblage isn’t), an artist is free to draw anything; literally the bounds of the universe are set by what the artist decides to put onto paper. The comic artist is free to draw from anything and therefore is able to access rhythms that those who capture the physical, material world are unable to to access. A film is always recording an existence in front of it; these bodies have their own rhythms, and the best the film can do is attempt to draw these already-lived refrains together into a cohesive part. I film is always going to capture and show what Grosz is writing. A film about a fidgeting child is a film about a fidgeting child. But a comics page has additional layers, most interestingly what is know as “pacing.” Pacing is the way the comic makes you read it. The size of the panels, their shape, their placement on a page, their existence at all. All of these things change the rhythm of reading the comic–the comics artist is able to interface, even if only on accident, with the rhythm, and thus chaos, more readily than a filmmaker. Take this short story by Jason below. 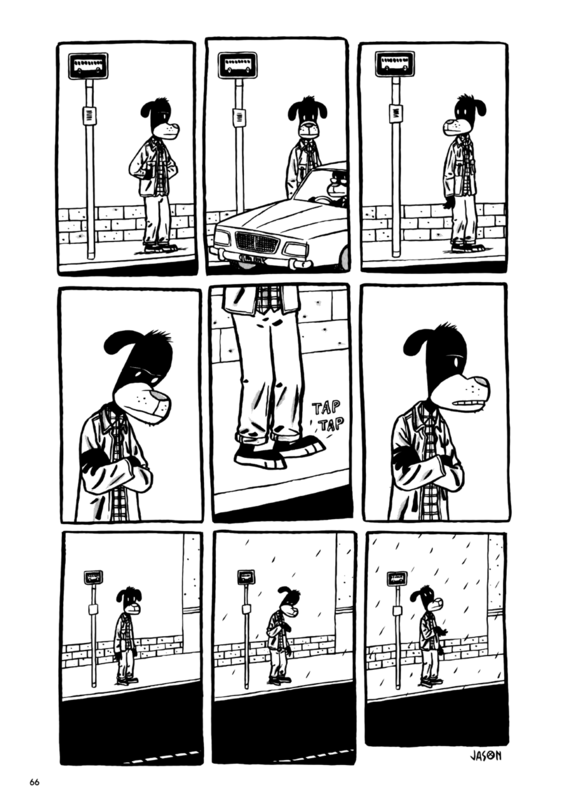 He creates a very specific rhythm of images and panels that set up a world of inside and outside–all that exists is this anthropomorphic dog and his street corner. 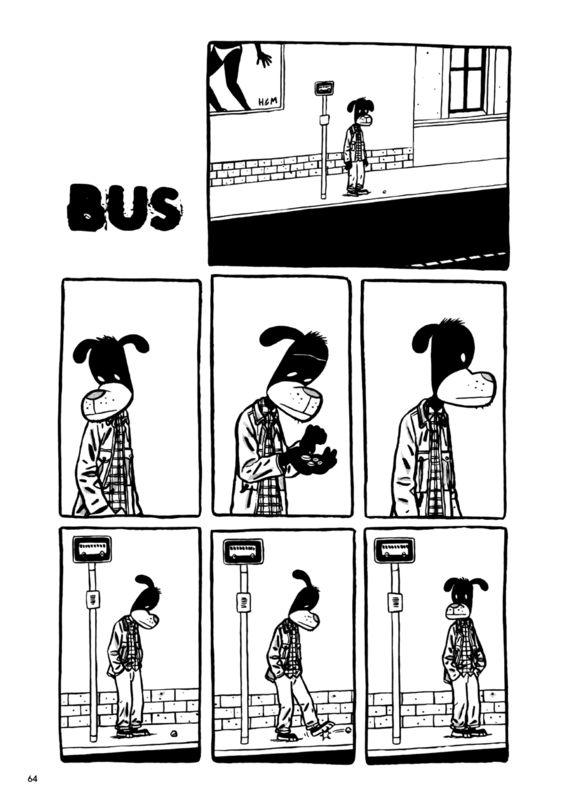 Eventually, there is rain, but what is missing from the panels is always pressing down on the comic: where is the bus? The pages are territories; the outside is immanent, just like the bus or the next page of the story. Jason, in setting up a rhythm of impatience and expectation, prepares the reader for anything to happen. There is a pacing of expectation, of something coming from the outside, but it never comes. Just some rain. 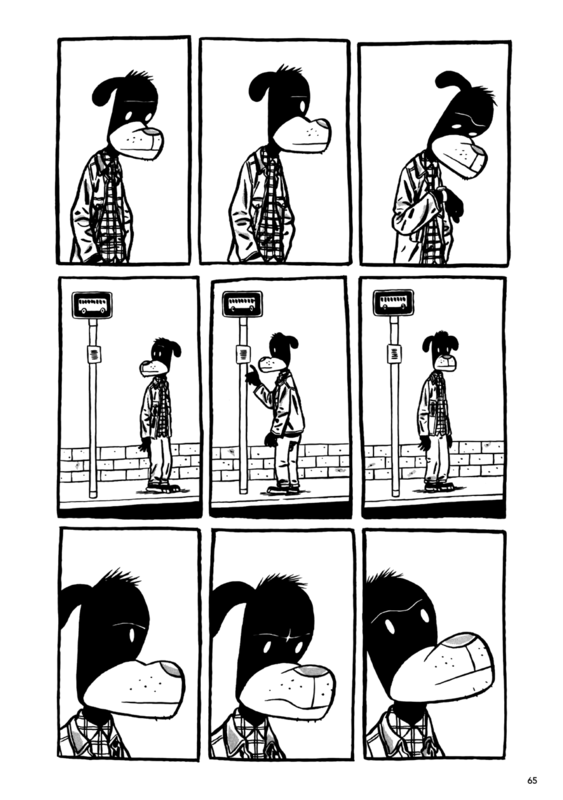 This entry was posted in Comics and tagged art, comics, deleuze and guattari, elizabeth grosz, jason, theory. Bookmark the permalink.